Does your group get most of its funds from just one source? Do you need a diverse revenue stream? If you are monocropping , you should meet the Matidzas. 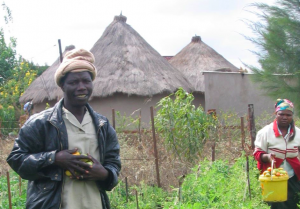 In a small South African town, Anna and William Matidza practice integrated farming, and it makes a huge difference. On their half acre they grow tomatoes, cabbage, sugar cane and onions—for their family and to sell in the village market. They sell fruit from trees they planted: papaya, peach, mulberries, mango, citrus, guava. With the profits they added irrigation and a piggery. They used to buy 150 bags of manure a year, now the pigs provide it free. By local standards, they are doing well. They have diverse revenue sources. Why their neighbors (who can see their success) don’t do the same puzzles the Matidzas. In monocropping you grow one crop like corn year after year. That requires costly (and poisonous) fertilizers and pesticides. If a disease or drought comes, too bad. A healthy farm is a mix that works together. The soil is enriched by inputs of water, manure, crop residue. There’s a proper place for nature, for songbirds and other wildlife. A blend of economic enterprises support each other: manure feeds the grasses and crops, which in turn feed the animals. Bees provide honey and pollination, often doubling crop yields. When one activity has a bad year, others make up for it. Your nonprofit’s enterprises should mix to create sustainability. Chances are most of your revenue comes from one or two programs. By all means, keep building these programs; they’re your bread and butter. But don’t diversify at your own risk. Create a well-rounded fundraising portfolio to increase revenue year after year. Target new markets while improving the existing ones that work now. 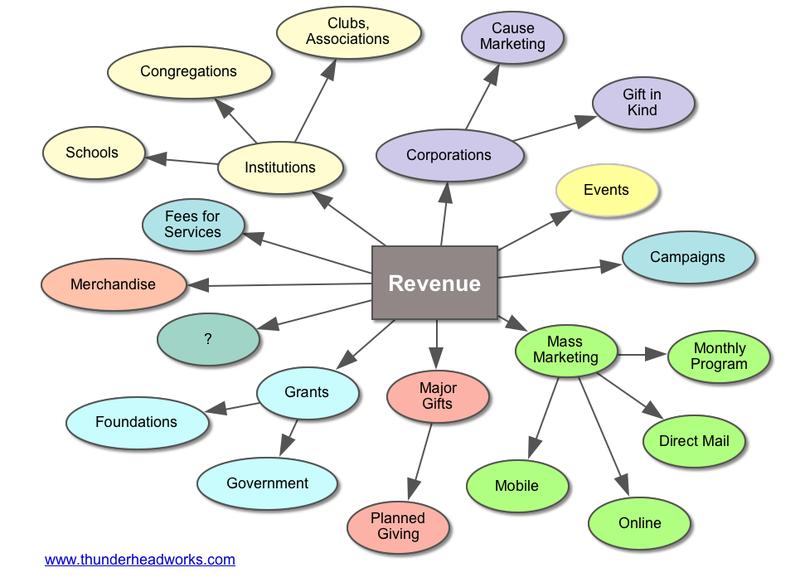 Why do you need a diverse revenue stream? Only a few of the 21 interviewees knew from the start where they would find their most promising funding sources. Often, they were uncertain about which source was most promising. But as these organizations pursued their growth, they realized which sources of funding seemed most promising and were willing to concentrate their efforts on that source, recruiting people and creating organizations that could best pursue that funding source. Over time, an incubator of several fundraising programs—with regular tweaking—will help you discover that big revenue stream. Lessen the chances of a financial disaster. If something goes wrong with that one big event or mailing, you could be in trouble. For example, distraction by a major catastrophe (like September 11 or a natural disaster), could wipe out your chances of reaching revenue goals. Diverse revenue sources and different revenue seasons lessens your risk. Reinforce your brand. The relationship is deepened as supporters and potential supporters see you in more places of their world. The different streams feed each other, so 1 + 1 = 3. Mass marketing creates a large pool of supporters who will connect you to major gifts or corporate partnerships, and introduce you to their congregation, school or a foundation. A grant or corporate gift can add to your credibility. A school program can generate many small first-time gifts from potentially long-term donors. And so on.